By Chris Williams: Former WBO light welterweight champion Mike ‘Mile High’ Alvarez (38-4,26 KOs) will be fighting journeyman Martin Angel Martinez (18-14-1, 11 KOs) on June 30 on the undercard of WBO super middleweight champion Gilberto ‘Zurdo’ Ramirez vs. Roamer Alexis Angulo on ESPN on Top Rank Boxing at the Chesapeake Energy Arena in Oklahoma City, Oklahoma. The televised portion of the card will be shown on ESPN at 9:00 p.m. ET. The fight card will be shown on ESPN+ at 6:00 p.m. ET. The 37-year-old Alvarado has won his last four fights against journeymen level opposition at welterweight. It’s been years since Alvarez beat a world class opponent in Brandon Rios in March 2013. That was the high point in Alvarado’s career has taken a hit since 2013 with losses to Ruslan Provodnikov, Juan Manuel Marquez and Rios. It’s unclear what Top Rank’s end game is for Alvarado. They’ve kept him but he’s not doing much. It would be ridiculous at this point if Top Rank were to feed Alvarado to WBO welterweight champion Terence Crawford for a title fight, because he’s done zero to earn a title shot. That obviously won’t stop them from making the fight if Top Rank boss Bob Arum wants to make a nice little in house fight, but it wouldn’t be fair to the boxing public to see Crawford demolish another over-matched opponent. Jeff Horn had no business being inside the ring with Crawford in their recent fight. Alvarado is arguably a poor man’s version of Horn. 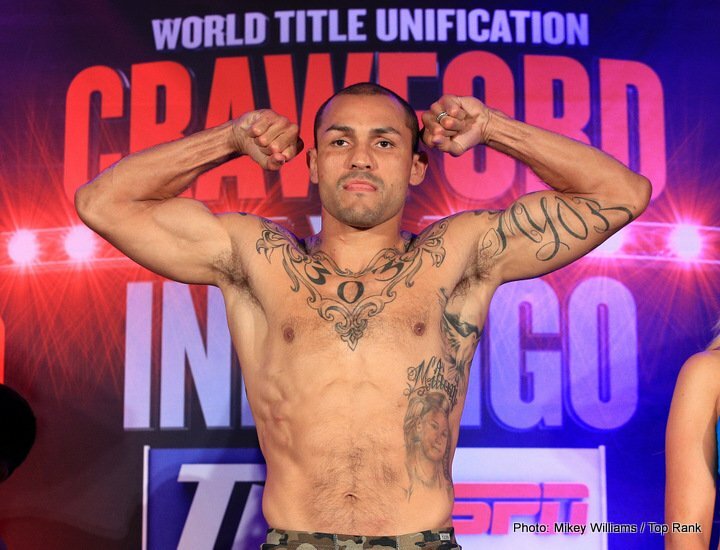 I guess there would be some boxing fans that would like to see Alvarado and Crawford face each other, but not many. Also on the Ramirez vs. Angulo card is 2016 Olympic Brazilian gold medalist Robson Conceicao (7-0, 4 KOs) facing Gavino Guaman (5-2, 1 KOs) in an eight round fight, heavyweight Trey Lippe (14-0, 14 KOs) fighting an opponent still to be determined. Lippe, 28, is the son of former heavyweight world champion Tommy Morrison. Team USA female lightweight Mikaela Mayer will be taking on Sheena Kaine (5-0, 1 KOs) in a 6 round fight. Lenny Zappavigna fights unbeaten light welterweight contender (27-0, 17 KOs) in a 10 round fight in the co-feature bout. The 26-year-old Ramirez will be making his fourth defense of his World Boxing Organization 168 title that he won two years ago. Ramirez’s opponent Angulo is ranked #10 by the WBO, and he’s beaten no one of note to be rated as high as he is with the WBO. Ramirez’s promoters at Top Rank appear to be trying to turn Ramirez into a star the safe way by having him defend against strictly beatable opposition. Ramirez’s three previous title defenses have come against these fighters: Max Bursak (34-5-1), Jessie Hart (24-1) and Habib Ahmed (25-1-1). Don’t let their records fool you. Those are not great super middleweights. Hart is a decent fighter, but he’s not in the same class as George Groves, Callum Smith, Tyron Zeuge, Chris Eubank Jr., Juergen Braehmer and Jose Uzcategui. It’s disappointing to see Ramirez milking his WBO title against such poor opposition. Top Rank should have had Ramirez fight in the World Boxing Super Series tournament against the best fighters in the super middleweight division so that he could prove himself against the top fighters in the division. The fact that Ramirez was kept out of the tournament suggests that there might be some concerns about whether he could cut the mustard against those types of fighters.